I went back this week to the “Best of Fine Cooking – Chocolate” 2006 edition of Fine Cooking magazine and chose another recipe based purely on how badly I wanted to eat the photo on the page. 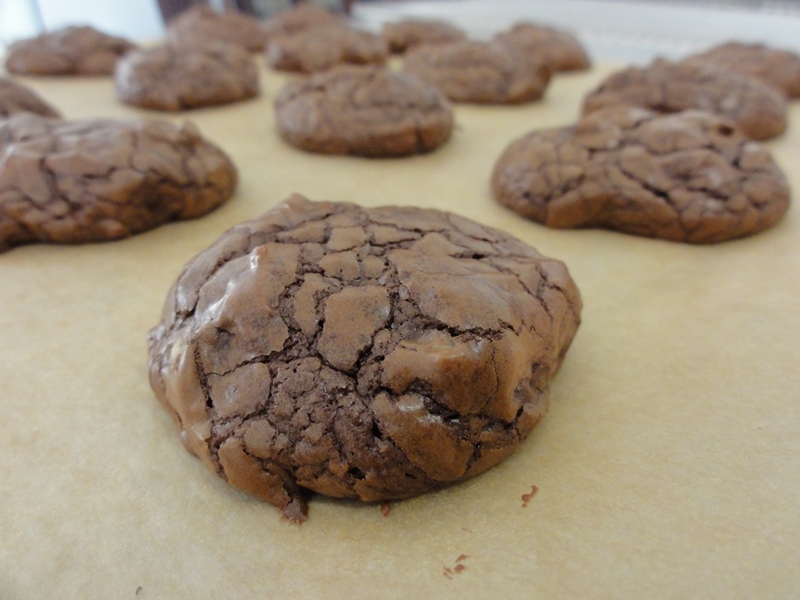 These cookies are similar to the Chocolate Brownie Recipes from a month ago but with more of a normal cookie consistency and with walnuts instead of pecans. 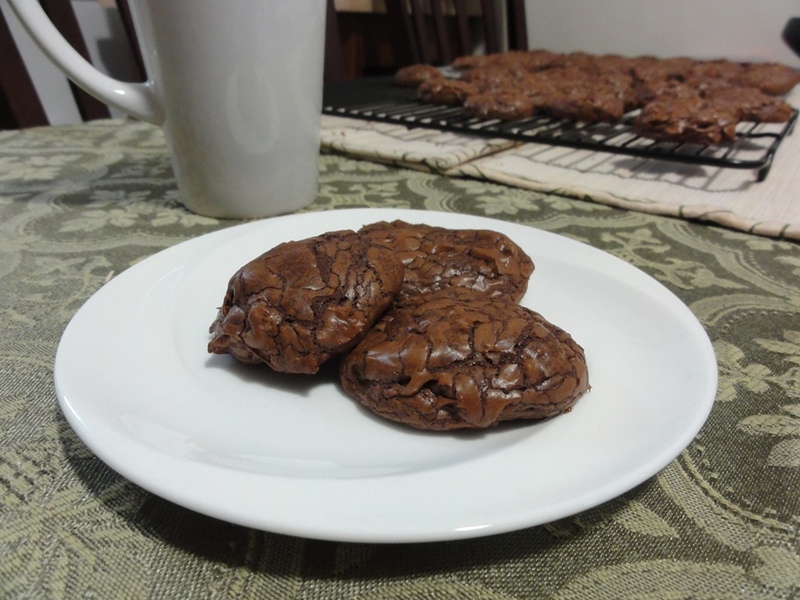 The title kind of gave that much away, but the most important part is that these cookies are deliciously rich and packed with chocolate. After last week’s debacle I decided it was best to closely follow the recipe. As usual I swapped in gluten-free flour and brought the weight down a little. The original recipe called for folding in 4 oz. of bittersweet or semisweet chopped chocolate at the end, but I got lazy and used 4 oz. of bittersweet mini chocolate chips that I had on hand. In my defense, chocolate chips have a consistent size so they distribute well through the batter and do a better job of ending up as wonderful little gems of melted chocolate than misshapen shards of chocolate off my chopping board would. 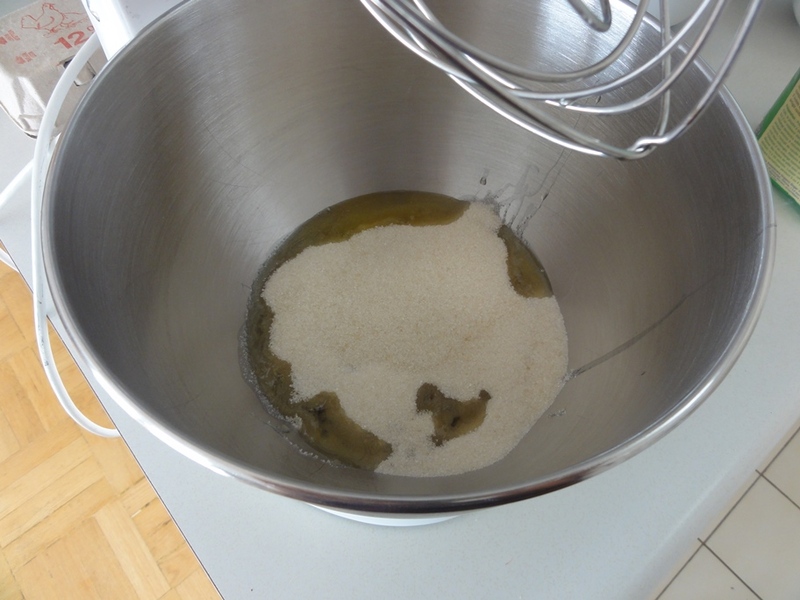 The only other change was the quantity of vanilla in that the recipe called for a 1/4 tsp across the whole batch, and being rather fond of vanilla I upped that to 1/2 tsp; in retrospect I think 1 tsp might have been better and still safe. 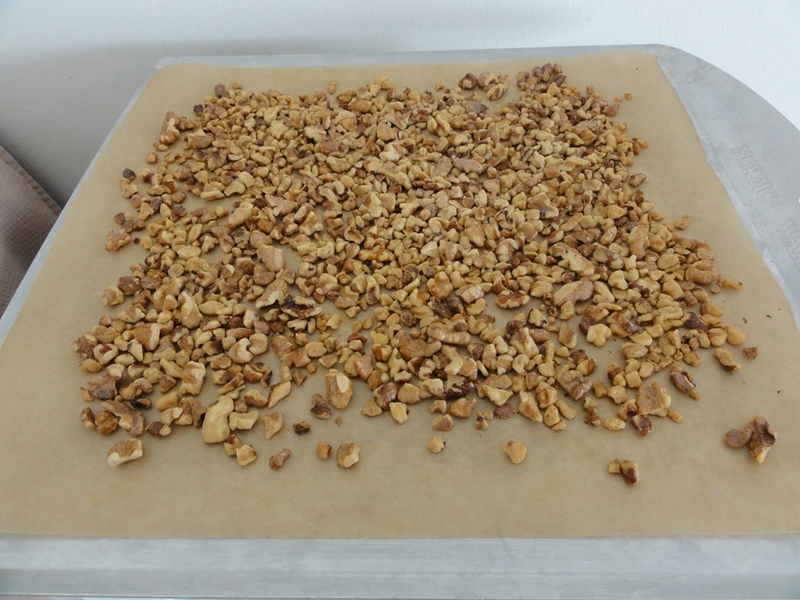 Toast the walnuts on parchment paper on a baking sheet for 5-7 minutes at 350°F. Fold in the 4 oz. of chocolate chips and the walnuts. I really wish I’d had enough white chocolate chips and macadamia nuts on hand to substitute those in for the 4 oz. of chocolate chips and walnuts, because this batter would be a terrific base for white chocolate macadamia nut cookies. Note to self: make those. 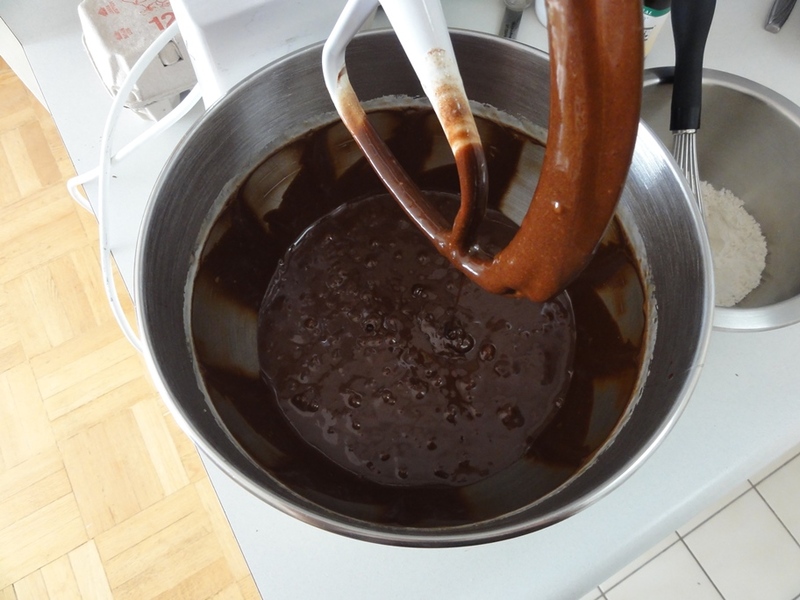 The original recipe calls for either bittersweet or semisweet chocolate. I prefer darker chocolate on taste, but you could easily swap the bittersweet for semisweet to lighten these cookies up. All of the quantities would stay the same. I would suggest in that case keeping to the 5 oz. of unsweetened chocolate though, because if that became bittersweet or semisweet I expect these cookies would become sickly sweet. 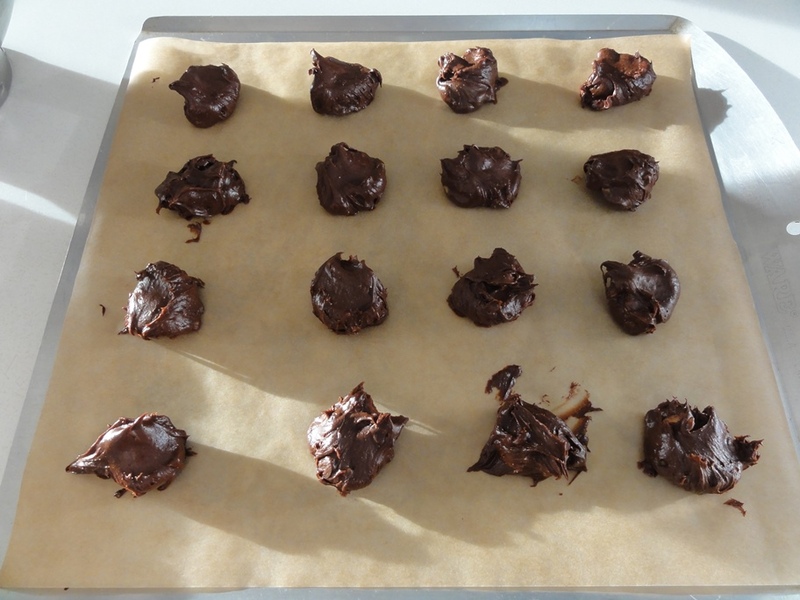 Another thought on chocolate (it seems appropriate for this recipe to be thinking a lot about chocolate): if you can’t get your hands on blocks of chocolate, chips will do just fine. The 5 oz. of unsweetened and 4 oz. of bittersweet needs to be chopped up so that it will melt in a reasonable amount of time. If you’re starting with chocolate chips then it’s already “chopped” and you don’t need to chop it any further; just don’t forget to keep your two 4 oz. quantities separate so that you’re folding in the 4 oz. 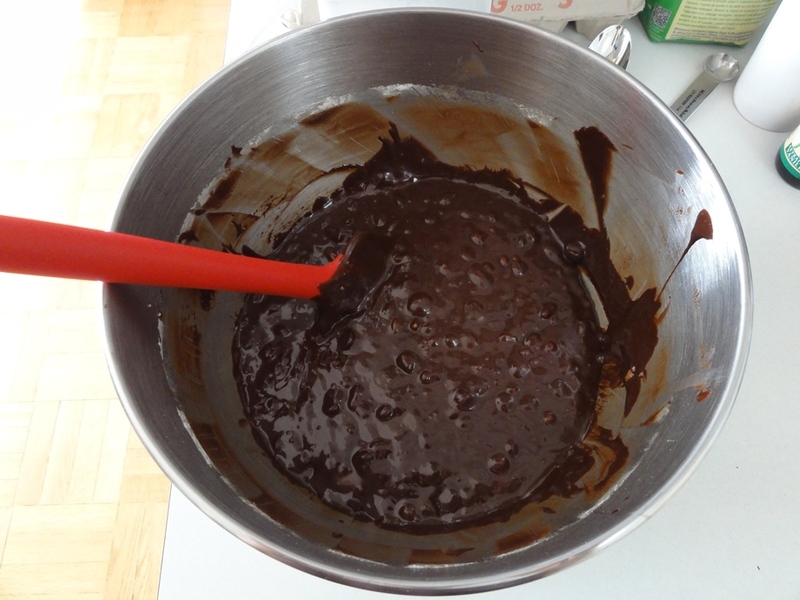 of chips towards the end – you wouldn’t want to miss out on melted gems of gooey chocolate! As per usual, when you’re involving chopped nuts in a recipe, toast them in the oven first. If you can get your hands on pre-chopped walnut pieces at the supermarket that saves a fair amount of time and mess, unless you happen to have a food processor and know how to use it to chop nuts (I’ve got the former, not quite the latter). While using chips would also save time for the 5 oz. of unsweetened and first 4 oz. 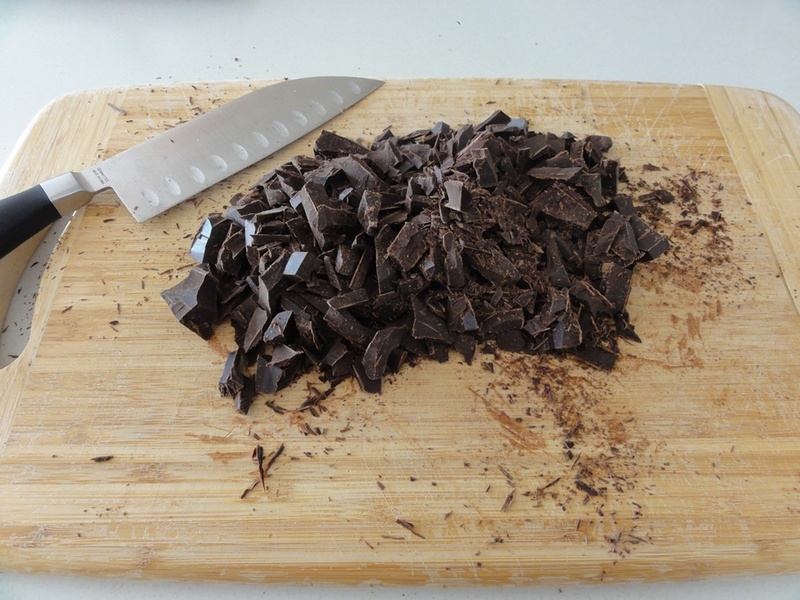 of bittersweet, there is something particularly satisfying about chopping up a block of chocolate. 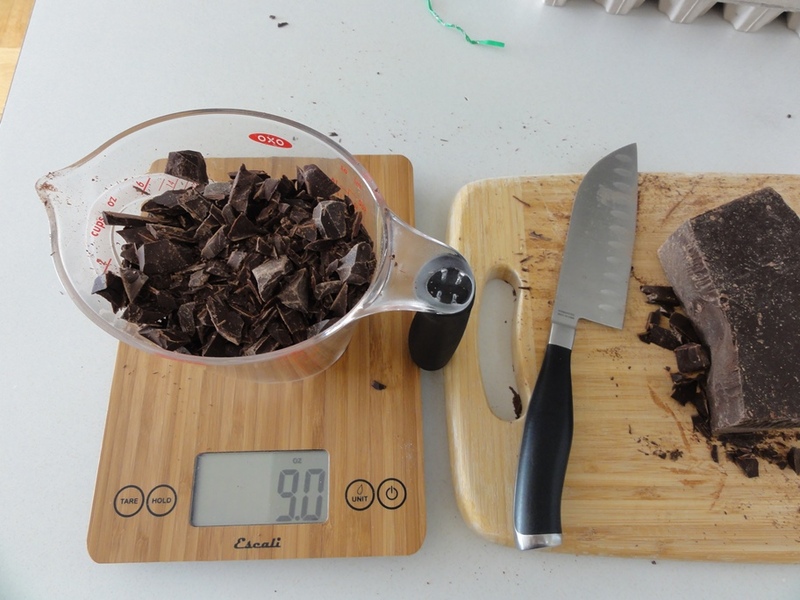 I’m very fond of my kitchen scale, especially when I’m weighing out chunks of chocolate. In this case the above 5 oz. 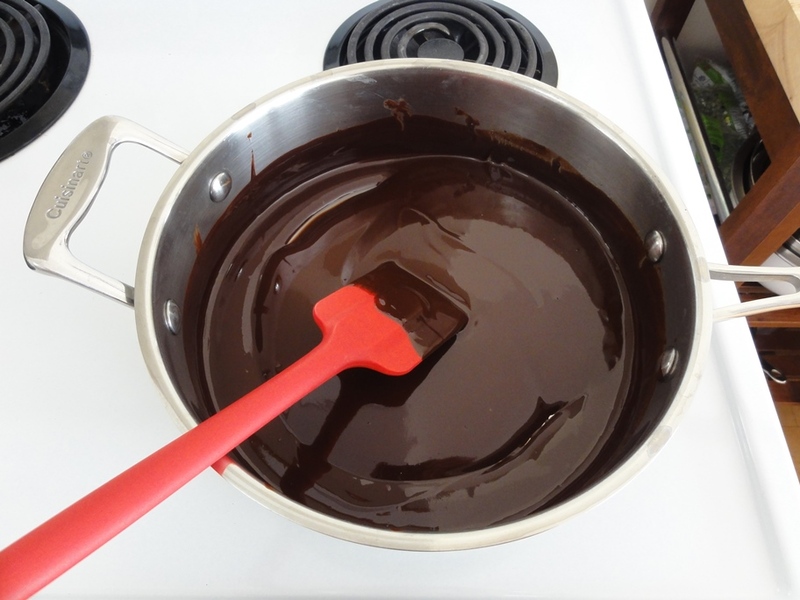 of unsweetened chocolate were added to the measuring cup, and then I sprinkled in chopped bittersweet until I’d added 4 oz. Sadly I then put that remaining block of bittersweet chocolate away instead of chopping it up and eating it. 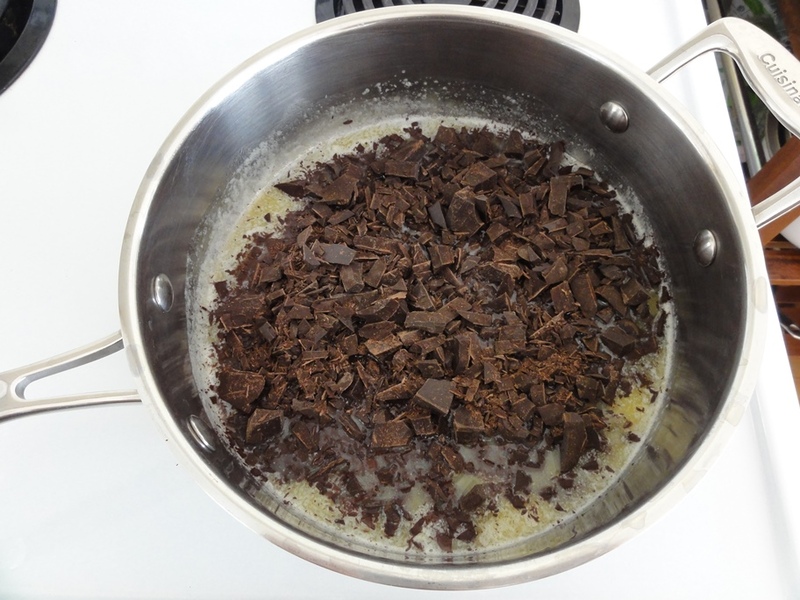 For recipes that call for melting chocolate and butter I’ve found that melting the butter first until it’s smooth and then adding the chocolate works very well. After a couple of minutes of gentle stirring with a spatula, scraping the sides and bottom as you do, you’ll have drinkable chocolate syrup. Unfortunately you can’t drink it because you need it for the cookies. There are eggs somewhere underneath all of that sugar. No, really! 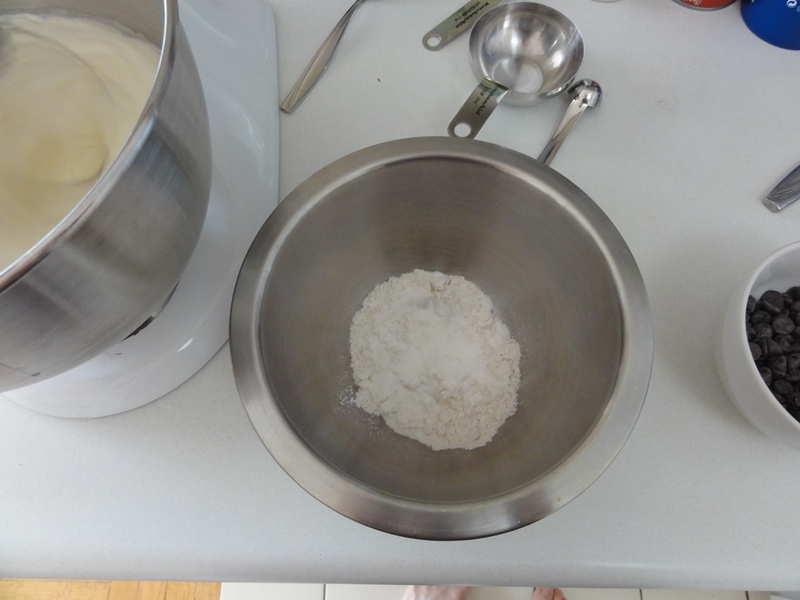 In the interest of ensuring a more consistent blending it doesn’t hurt to mix the flour, salt, and baking powder together with a whisk in a small bowl before you toss it into the batter. 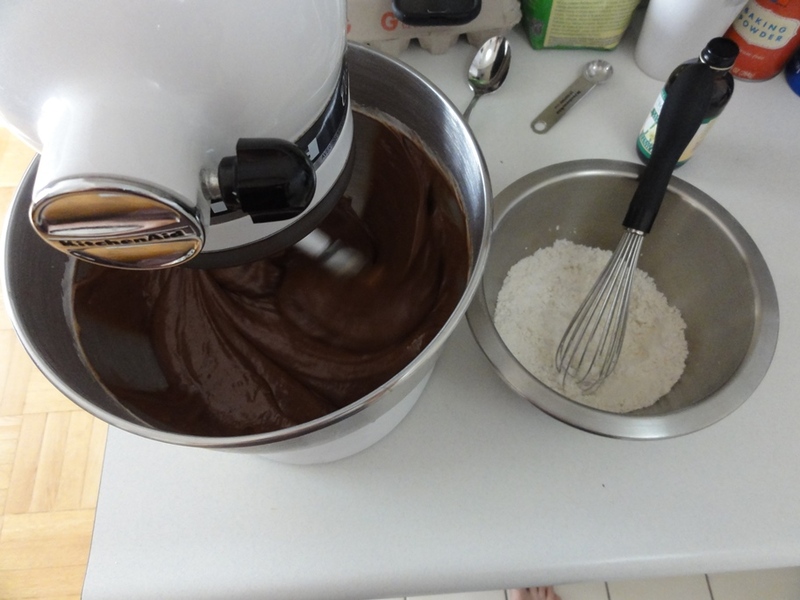 This is also something you can do while the stand mixer is crazily whisking away for 10 minutes. 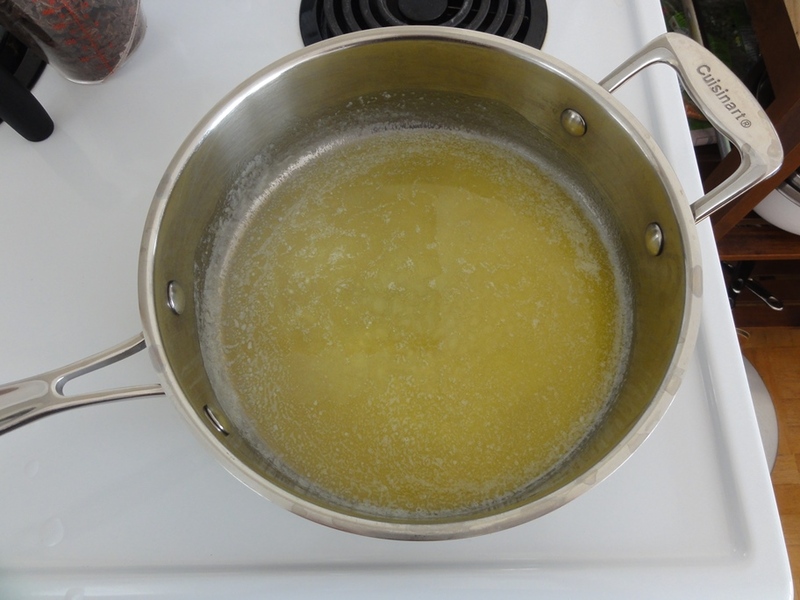 Once those 10 minutes are up your eggs and sugar should be fluffy and bubbly. 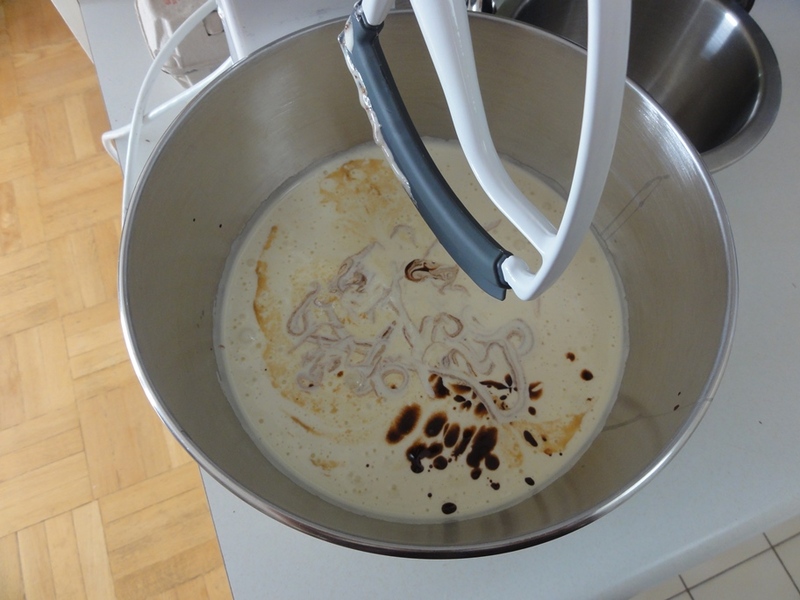 While actively whisking it should have appeared to be foamy. I’m sure there are technical terms for all of this. I switched to the stirring attachment after pouring in the vanilla and chocolate because the side-scraper makes my life easier. 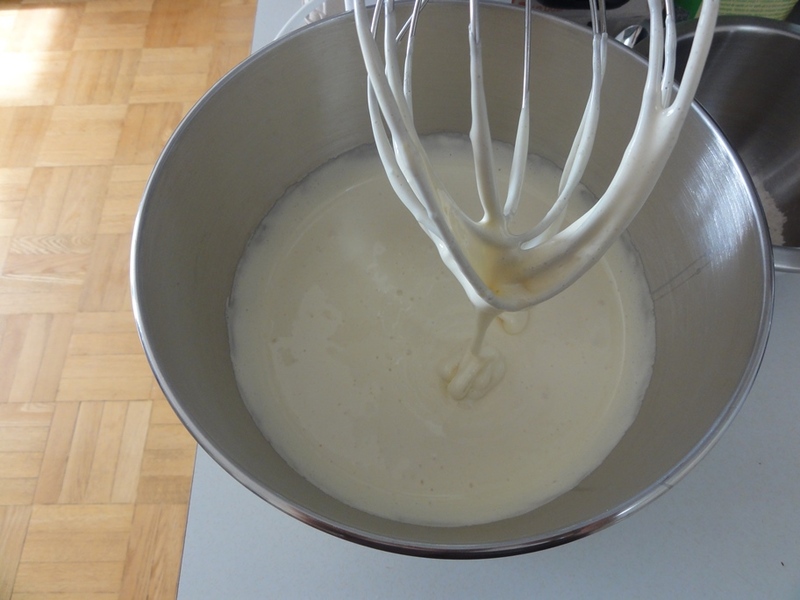 The whisk would probably have still sufficed as the dough stays fairly fluid. From this point on it takes great reserves of willpower to avoid consuming the dough raw. The recipe was mindful of giving the cookies plenty of room so I was careful, but they didn’t spread out that much in the end. You could probably fit 20 or even 25 on a tray in a tight squeeze. Do you know what time it is? It’s cookie time!